Phone number format should be 123-456-7890 or 1234567890. Password should contain minimum 6 characters. By registering with MobileRVing.com you agree to receive the free MobileRVing.com newsletter. You can unsubscribe anytime through the URL provided at the bottom of each newsletter. These general delivery terms (the “Terms”) form an integral part of the Contactus Reservation Agreement (the "Contactus Reservation Agreement" and together with the Terms, "Agreement") entered into between an Partner and MobileRVing.com (each a "Party" and collectively the "Parties"). 1. DEFINITIONS In addition to terms defined elsewhere in this Agreement, the following definitions apply throughout this Agreement, unless the contrary intention appears: "MobileRVing.com Platform" means the webcontactus(s), apps, tools, platforms or other devices of MobileRVing.com on which the Service is made available. "Customer Service" means the customer service desk of MobileRVing.com which can be reached at [email protected] or such other address as set out in this Agreement. "Data Controller" means a natural or legal person who alone or jointly with others determines the purposes and means of the processing of Personal Data. "Extranet" means the online system which can be accessed by the Partner (after identification of the username and the password) through the webcontactus www.MobileRVing.com, for uploading, changes, verifying, updates and/or amendments of the Partner Information (including rates, availability, sites) and reservations. "Force Majeure Event" means any of the following events affecting multiple Guests and multiple Partner properties: acts of God, volcanic eruptions, (natural) disasters, fire, (acts of) war, hostilities or any local or national emergency, invasions, compliance with any order or request of any national, provincial, port or other public authority, government regulations or interventions, military actions, civil war or terrorism, (biological, chemical or nuclear) explosions, rebellions, riots, insurrection strikes, civil disorder (or the material or substantial threat or justified apprehension of any of the foregoing events), curtailment of transportation facilities, closing of airports or any other exceptional and catastrophic event, circumstance or emergency which makes it impossible or illegal for Guests to travel to or stay at, or prevents Guests from traveling to or staying at, the Partner. "Guest" means a visitor to the Platforms or a customer or guest of the A Partner. "Intellectual Property Right" means any patent, copyright, invention, database right, design right, registered design, trade mark, trade name, brand, logo, service mark, know-how, utility model, unregistered design or, where relevant, any application for any such right, know-how, trade or business name, domain name (under whatever extension, e.g. .com, .nl, .fr, .eu, etc.) or other similar right or obligation whether registered or unregistered or other industrial or intellectual property right subsisting in any territory or jurisdiction in the world. "Personal Data" means any information relating to an identified or identifiable natural person (including Customer Data). "Platforms" means the webcontactus(s), apps, tools, platforms and/or other devices of MobileRVing.com and its affiliated companies and business partners on or through which the Service is (made) available. "Service" means the online contactus reservation system of MobileRVing.com through which Partners can make their cabins, RV contactuss or primitive contactuss available for reservation, and through which Guests can make reservations at such Partners, customer service and the Communication Service. "System" means the system that Partners can access to use and utilize the services, functionalities and administration of the Contactus on the Platform (including rates, images, etc.). 2. PARTNER OBLIGATIONS 2.1 Partner Information 2.1.1 Information provided by the Partner for inclusion on the Platforms shall include information relating to the Partner (including pictures, photos and descriptions), its amenities and services and the sites available for reservation, details of the rates (including all applicable taxes, levies, surcharges and fees) and availability, cancellation and no-show policies and other policies and restrictions (the "Partner Information") and shall comply with formats and standards provided by MobileRVing.com. MobileRVing.com reserves the right to edit or exclude any information upon becoming aware that it is incorrect or incomplete or in violation of the terms and conditions of this Agreement. 2.1.2 The Partner represents and covenants that the Partner Information shall at all times be true, accurate and not misleading. The Partner is at all times responsible for a correct and up-to-date statement of the Partner Information, including additional availability of sites for certain periods or any extraordinary (material adverse) events or situations (e.g. renovation or construction at or near the facility). The Partner shall update the Partner Information on a daily basis (or such more frequent basis as may be required) and may – at any time – change via the Extranet (i) the rate of its available sites bookable, and (ii) the number or type of available sites. 2.1.3 The information provided by the Partner for the Platforms shall remain the exclusive property of the Partner. Information provided by the Partner may be edited or modified by MobileRVing.com and subsequently be translated into other languages, whereas the translations remain the exclusive property of MobileRVing.com. The edited and translated content shall be for exclusive use by MobileRVing.com on the Platforms and shall not be used (in any way or form) by the Partner for any other distribution or sales channel or purposes. Changes or updates to the Partner’s descriptive information are not allowed unless prior written approval has been obtained from MobileRVing.com. 2.1.4 Unless MobileRVing.com agrees otherwise, all changes, updates and/or amendments to the Partner Information (including rates, availability, sites) shall be made by the Partner directly and online through the Extranet or such other ways as MobileRVing.com may reasonably indicate. Updates and changes with respect to pictures, photos and descriptions will be processed as quickly as reasonably possible by MobileRVing.com. 2.2 Parity and site restrictions 2.2.1 The Partner shall give MobileRVing.com rate and availability parity ("Parity"). Rate Parity means the same or better rates for the same Partners, same site type, same dates, same bed type, same number of guests, same or better amenities and add-ons (e.g. free breakfast, Wi-Fi, early/late check-out), same or better restrictions and policies, such as reservation changes and cancellation policy, as are available through the Partner’s apps or call centers (including the customer reservation system), or directly at the Partner, with any competitor of MobileRVing.com (which includes any online or offline reservation or booking agency or intermediary) and/or with any other (online or offline) third party that is a business partner of or in any other way related with or connected to the Partner. Rate parity does not apply with respect to rates intended for a closed user group ("closed user group" means a group with defined limitations where membership is not automatic and where: (i) consumers actively opt in to become a member; (ii) any online or mobile interface used by closed user group members is password protected; (iii) closed user group members have completed a customer profile; and (iv) the consumer to which the rate is offered or made available has already made at least one prior booking as a member of the closed user group) provided that such rates are not (directly or indirectly) publicly (made) available. In the event that a closed user group rate is (directly or indirectly) publicly (made) available (by the Partner, a (direct/indirect) competitor of MobileRVing.com or on any third party (platform) (including any (meta) search engine or price comparison webcontactus. Availability Parity means that the Partner shall provide MobileRVing.com with such availability (i.e. sites available for booking at the Platform) that are at least as favorable as those provided to any competitor of MobileRVing.com (which includes any online or offline reservation or booking agency or intermediary) and/or with any other (online or offline) third party that is a business partner of or in any other way related with or connected to the Partner. 2.2.2 The restrictions and conditions (including the site price) for sites made available for reservation on the MobileRVing.com Platform shall at all times be in accordance with Clause 2.2.1 and make sense for all parties involved (including consumers). 2.2.3 MobileRVing.com shall be entitled to give a discount on the site price – at its own costs – to its closed user group members. 2.2.4 In the spirit of this Agreement and subject at all times to the availability parity set out in Clause 2.2.1, the Partner is encouraged to provide MobileRVing.com with fair access to all site types (including various policies and restrictions) and rates available during the term of the Agreement (during periods of low and high demand (including during conventions, congresses and special events)). 2.3 Reservation, Guest Reservation, complaints and Best Price Guarantee 2.3.1 When a reservation is made by a Guest on the Platform, the Partner shall receive a confirmation for every reservation made via MobileRVing.com, which confirmation shall include the date of arrival, the number of nights, the site type (including preferences (if available)), the site rate, the Guest's name, address and email (collectively "Customer Data") and such other specific request(s) as made by the Guest. MobileRVing.com is not responsible for the correctness and completeness of the information and dates provided by Guests and MobileRVing.com is not responsible for the payment obligations of the Guests relating to their (online) reservation. For the avoidance of doubt, the Partner shall on a regular basis (but at least on a daily basis) check and verify on the Extranet (the status of) the reservations made. 2.3.2 By making a reservation through the Platforms, a direct contract (and therefore legal relationship) is created solely between the Partner and the Guest (the "Guest Reservation"). 2.3.3 The Partner is bound to accept a Guest as its contractual party, and to handle the online reservation in compliance with the Partner Information (including rate) contained on the Platforms at the time the reservation was made and the reservation confirmation, including any supplementary information and/or wishes made known by the Guest. 2.3.4 Other than the fees, extras and (sur-)charges as set out in the confirmed booking, the Partner shall not charge the customer any transaction/administration fee or charge for the use of any payment method (e.g. credit card charge). 2.3.5 Complaints or claims with respect to (the products or service offered, rendered or provided by) the Partner or specific requests made by Guests are to be dealt with by the Partner, without mediation by or interference of MobileRVing.com. MobileRVing.com is not responsible for and disclaims any liability with respect to such claims from Guests. MobileRVing.com may at all times and at its sole discretion (a) offer customer (support) services to a Guest; (b) act as intermediate between the Partner and a Guest; (c) provide – at the costs and expenses of the Partner – alternative Partners of an equal or better standard in the event of an overbooking or other material irregularities or complaints with respect to the Partner; or (d) otherwise assist a Guest in its communication with or actions against the Partner. 2.4 Overbooking and cancellation 2.4.1 The Partner shall provide the sites booked and in the event that the Partner is not able to meet its obligations under this Agreement for any reason whatsoever, the Partner shall promptly inform MobileRVing.com via Customer Service ([email protected]; whereas the subject line of each email shall state "overbooking"). Unless MobileRVing.com has arranged for alternative Partners (to be verified by the Partner with MobileRVing.com), the Partner will use its best endeavors to procure alternative arrangements of equal or superior quality at the expense of the Partner and in the event that no Site is available upon arrival, the Partner will: (a) find suitable alternative accommodations of an equal or better standard to the Partner holding the Guest ‘s guaranteed booking; (b) provide instructions to the alternative accomodations for the Guest and other members of the Guest’s party who are listed in the Guest’s guaranteed booking; and (c) reimburse and compensate the Guest for all reasonable costs and expenses (e.g. cost of alternative accomodations, transportation, telephone costs) made, suffered, paid or incurred by the Guest due to or caused by the overbooking. 2.4.2 The Partner is not allowed to cancel any online reservation. 2.5 Credit Card guarantee 2.5.1 The Partner shall at all times accept most major credit cards (including MasterCard, Visa and American Express) for guarantee of a booking. The Partner is responsible for the verification of the validity of these credit card details, the (pre-) authorization of the credit card and the limit of credit on the date of the overnight stay(s) booked. The Partner shall, upon receipt of a booking, promptly verify and preauthorize the credit card. 2.5.2 If the Partner wants to take payment from the credit card before the date of check-in, it must ensure that the upfront payment conditions (including the (special) rate restrictions, terms and conditions for or connected with such prepayment) are clearly explained to Guests in the information made available to the Guest prior to making a reservation and included in the Partner Information. 2.5.3 The Partner shall be responsible for charging the Guest for the consumed stay, no-show fee or charged cancellation (including applicable Taxes for which the Partner shall be liable and remit to the relevant tax authorities). Credit cards shall be charged in the same currency as set out in the reservation of a Guest. To the extent that this is not possible, the Partner may charge the credit card of the Guest in a different currency with a reasonable and fair exchange rate. 2.5.4 In the event of offering sites for cash payment only, no credit card details will be made available by MobileRVing.com to the Partner (each "Cash Only Partner" or "COA") as a guarantee for the booking. 2.6 Personal Data 2.6.1 The Partner is required to comply, and to have its service providers comply on an ongoing basis, with the requirements, compliance criteria and validation processes as set forth in the Payment Card Industry ("PCI") Data Security Standard as promulgated from time to time by the major credit card companies. 2.6.2 The Partner acknowledges that it is responsible for the security of the Personal Data it processes within the context of this Agreement and MobileRVing.com acknowledges that it is responsible for the security of the Personal Data it processes within the context of this Agreement. 2.6.3 The Partner acknowledges and accepts that MobileRVing.com may from time to time, as part of its service to the Guest and Partner and in order to protect the Guest against any (potential or threatening) data breach or other fraudulent activities (e.g. phishing) on the side of the Partner, facilitate the communication between the guest and the Partner (the "Communication Service") through its system (including any required process, storage, receipt, access, insight and screening of such communication by MobileRVing.com). To the extent MobileRVing.com processes Personal Data related to the Partner, such Personal Data shall be processed by MobileRVing.com in accordance with the MobileRVing.com Privacy and Cookies Policy for Partner Providers. The Partner hereby irrevocably and unconditionally agrees and consents to the processing of Personal Data by MobileRVing.com and warrants that it has duly and diligently informed (and if required by applicable laws, obtained the written consent of) its employees, agents, representatives, staff members and other individuals of/for/when using the Communication Service for or on the Partner's behalf (including the process, receipt, insight, storage, screening and access of such communication by MobileRVing.com). 2.7 Extranet MobileRVing.com will provide the Partner with a resort user id and password which allows the Partner to access the Extranet. The Partner shall safeguard and keep the user ID and password confidential and safely stored and not disclose it to any person other than those who need to have access to the Extranet. The Partner shall immediately notify MobileRVing.com of any (suspected) security breach or improper use. 2.8 Force Majeure Event In the event of a Force Majeure Event, the Partner shall not charge (and shall repay (if applicable)) the Guests affected by the Force Majeure Event any fee, costs, expenses or other amount (including the (non-refundable) rate or the no-show, (change of) reservation or cancellation fee) for (i) any cancellation or change of the reservation made by the Guests, or (ii) that part of the reservation that was not consumed, due to the Force Majeure Event. In the event of reasonable and justified doubt, the Partner may ask a Guest to provide reasonable evidence of the causality between the Force Majeure Event and cancellation, no-show or change of reservation (and provide MobileRVing.com upon request with a copy of such evidence). In order for MobileRVing.com to register any cancellation, no-show or amendment of the reservation due to a Force Majeure Event, the Partner shall inform MobileRVing.com within 2 business days after (a) the scheduled check-out date of the no-show or cancellation, or (b) check-out, the number of days actually stayed. MobileRVing.com will not charge any commission in the event of a registered no-show or cancellation or over that part of the booking which is not consumed due to the Force Majeure Event. 3. LICENSE 3.1 The Partner hereby grants MobileRVing.com a non-exclusive, royalty-free and worldwide right and license (or sublicense as applicable): (a) to use, reproduce, have reproduced, distribute, sublicense, communicate and make available in any method and display those agreed upon elements of the Intellectual Property Rights of the Partner as provided to MobileRVing.com by the Partner pursuant to this Agreement and which are necessary for MobileRVing.com to exercise its rights and perform its obligations under this Agreement; (b) to use, reproduce, have reproduced, process, distribute, sublicense, display and utilize (including without limitation to publicly perform, modify, adapt, communicate, reproduce, copy and make available to the public in any manner whatsoever) the Partner Information. 3.2 MobileRVing.com may sublicense, make available, disclose and offer the Partner Information (including the relevant Intellectual Property Rights) of the Partner and special offers made available by the Partner on the Platforms and all such further rights and licenses set out in this Agreement via or in collaboration with (the webcontactuss, apps, platform, tools or other devices of) affiliated companies and/or third parties (the "Third Party Platforms"). 3.3 In no event shall MobileRVing.com be liable to the Partner for any acts or omissions on the part of any Third Party Platforms. The sole remedy for the Partner with respect to such Third Party Platforms is (i) to request MobileRVing.com (which has the right and not the obligation) to disable and disconnect with such Third Party Platform, or (ii) termination of this Agreement, all in accordance with the terms of this Agreement. 4. RANKING, GUEST REVIEWS, MARKETING AND FACILITATED PAYMENT (AGENCY) MODEL 4.1 Ranking 4.1.1 The order in which the Partner is listed on the Platforms (the "Ranking") is determined automatically and unilaterally by MobileRVing.com. Ranking is based on and influenced by various factors, including but not limited to their customer status with Southeast Publications, the minimum availability stated by the Partner, the number of bookings related to the number of visits to the relevant Partner property page on the Platform (the "Conversion"), the volume realized by the Partner, the ratio of cancellations, the guest review scores, the customer service history, the number and type of complaints from Guests and the on-time payment record of the Partner. 4.1.2 The Partner can influence its ranking by allowing Southeast Publications partnering with Southeast Publications’Guest Guide Services. The Partner shall not make any claim against MobileRVing.com regarding the Ranking of Partner. 4.2 Guest reviews 4.2.1 Guests who have stayed at the Partner will be asked by MobileRVing.com to comment on their stay at the Partner and to provide a score for certain aspects of their stay. 4.2.2 MobileRVing.com reserves the right to post these comments and scores on the Platforms. The Partner acknowledges that MobileRVing.com is a distributor (without any obligation to verify) and not a publisher of these comments. 4.2.3 MobileRVing.com undertakes to use its best efforts to monitor and review Guest reviews with respect to obscenities or the mention of an individual’s name. 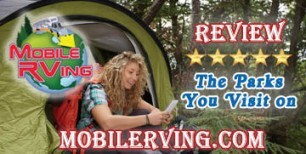 MobileRVing.com reserves the right to refuse, edit or remove unfavorable reviews in the event that such reviews include obscenities or mention an individual’s name. 4.2.4 MobileRVing.com will not enter into any discussion, negotiation or correspondence with the Partner with respect to (the content of, or consequences of the publication or distribution of) the Guest reviews. 4.2.5 MobileRVing.com shall not have and disclaims any liability and responsibility for the content and consequences of (the publication or distribution of) any comments or reviews howsoever or whatsoever. 4.2.4 The guest reviews are for exclusive use by MobileRVing.com and can be made available on such Platforms as from time to time made available by MobileRVing.com. MobileRVing.com exclusively retains ownership of all rights, title and interest in and to (all intellectual property rights of) the guest reviews and the Partner is not entitled to (directly or indirectly) publish, market, promote, copy, scrape, (hyper-/deep)link to, integrate, obtain, utilize, combine, share or otherwise use the guest reviews without prior written approval of MobileRVing.com. 4.3 (Online) marketing and PPC advertising 4.3.1 MobileRVing.com is entitled to promote the Partner using the Partner’s name(s) in online marketing, including email marketing and/or pay-per-click (PPC) advertising. MobileRVing.com runs online marketing campaigns at its own costs and discretion. 4.3.2 The Partner is aware of the working methods of search engines, such as spidering of content and ranking of URLs. MobileRVing.com agrees that if the Partner becomes aware of behavior by Third Party Platforms that breaches the Partner’s Intellectual Property Rights, then the Partner will notify MobileRVing.com in writing with details of the conduct and MobileRVing.com will use its commercially reasonable endeavors to ensure that the relevant third party takes steps to remedy the breach. 4.3.3 The Partner agrees not to use, display, benefit from, include, utilize, refer to or specifically target the MobileRVing.com brand/logo (including trade name, trade mark, service mark or other similar indicia of identity or source) whether directly through keyword purchases that use MobileRVing.com's Intellectual Property Rights, for price comparison purposes or any other purposes (whether on the Partner platform or any third party platform, system or engine or otherwise), unless approved in writing by MobileRVing.com.. 4.4 Payments The Partner shall only issue an invoice to the Guest (and provide such Guest upon his/her first request with an invoice) for the full amount of the reservation (including or plus (as required by applicable laws) all applicable Taxes, surcharges and fees). The Partner shall not invoice (or send an invoice to) MobileRVing.com for the reservation or stay. Nothing in this Agreement shall constitute or imply that MobileRVing.com acts or operates as a merchant of record or (re)seller of the site. 5. REPRESENTATIONS AND WARRANTIES 5.1 The Partner represents and warrants to MobileRVing.com that for the term of this Agreement: (i) the Partner has all necessary rights, power and authority to use, operate, own (as applicable), (sub)license and have MobileRVing.com make available on the Platforms (a) the relevant Partners, and (b) the Intellectual Property Rights with respect to, as set out or referred to in the Partner Information made available on the Platforms; (ii) the Partner holds and complies with all permits, licenses and other governmental authorizations, registrations and requirements necessary for conducting, carrying out and continuing its operations and business and making the Partner available on the Platforms for reservation (including for short-term stay); (iii) the Partner is duly registered with all relevant tax authorities (including applicable statutory (local) revenue collection authorities) as a RV Resort, Campground or other Partner provider; (iv) the price for the sites advertised on the Platforms correspond to the best available price for an equivalent stay with the Partner and a better price cannot be obtained by a Guest making a reservation with the Partner directly or via another (third) party or via another medium or channel; and (v) the Partner (which includes for the purpose of this warranty both the operator as well as the owner of the property) and its (their) directors and (direct, indirect and ultimate (beneficial)) owners (and their directors) are not in any way connected to, part of, involved in or related to or under the control, management or ownership of: (a) terrorists or terrorist organizations; (b) parties/persons (i) listed as (special) designated nationals/entities or blocked person/entities, or (ii) otherwise subject to any applicable trade embargo, or financial, economic and trade sanctions; and (c) parties/persons guilty of money laundering, bribery, fraud or corruption. 5.2 Each Party represents and warrants to the other Party that for the term of this Agreement: (i) it has the full corporate power and authority to enter into and perform its obligations under this Agreement; (ii) it has taken all corporate action required by it to authorize the execution and performance of this Agreement; (iii) this Agreement constitutes legally valid and binding obligations of that Party in accordance with its terms; and (iv) each Party shall comply with all applicable governmental laws, codes, regulations, ordinances and rules of the country, state or municipality under which law the relevant Party is incorporated with respect to the products (to be) offered and/or services (to be) rendered by such Party. 5.3 Except as otherwise expressly provided in this Agreement, neither Party makes any representations or warranties, express or implied, in connection with the subject matter of this Agreement and hereby disclaims any and all implied warranties, including all implied warranties of merchantability or fitness for a particular purpose regarding such subject matter. 5.4 MobileRVing.com disclaims and excludes any and all liability with respect to the Partner which is related to any (temporary and/or partial) breakdown, outages, downtime, interruption or unavailability of the Platforms, the Service and/or the Extranet. MobileRVing.com provides (and the Partner accepts) the Service, the Platform and the Extranet on an "as is" and "as available" basis. 6. INDEMNIFICATION AND LIABILITY 6.1 Each Party (the "Indemnifying Party") shall be liable towards, and compensate, indemnify and hold the other Party (or its directors, officers, employees, agents, affiliated companies and subcontractors) (the "Indemnified Party") harmless for and against any direct damages, losses (excluding any loss of production, loss of profit, loss of revenue, loss of contract, loss of or damage to goodwill or reputation, loss of claim or any special, indirect or consequential losses and/or damages), liabilities, obligations, costs, claims, claims of any kind, interest, penalties, legal proceedings and expenses (including, without limitation, reasonable attorneys’ fees and expenses) actually paid, suffered or incurred by the Indemnified Party pursuant to: (i) a breach of this Agreement by the Indemnifying Party, or (ii) any claim from any third party based on any (alleged) infringement of the third party's Intellectual Property Right by the Indemnifying Party. 6.2 The Partner shall fully indemnify, compensate and hold MobileRVing.com (or its directors, officers, employees, agents, affiliated companies and subcontractors) harmless for and against any liabilities, costs, expenses (including, without limitation, reasonable attorneys’ fees and expenses), damages, losses, obligations, claims of any kind, interest, penalties and legal proceedings paid, suffered or incurred by MobileRVing.com (or its directors, officers, agents, affiliated companies and subcontractors) in connection with: (i) all claims made by Guests concerning inaccurate, erroneous or misleading information of the Partner on the Platforms; (ii) all claims made by Guests concerning or related to a stay in the Partner, overbooking or (partially) canceled or wrong reservations or repayment, refund or charge-back of the Site Price; (iii) all other claims from Guests which are fully or partially attributable to or for the risk and account of the Partner (including its directors, employees, agents, representatives and the premises of the Partner) (including claims related to (lack of) services provided or product offered by the Partner) or which arise due to tort, fraud, willful misconduct, negligence or breach of contract (including the Guest Reservation) by or attributable to the Partner (including its directors, employees, agents, representatives and the premises of the Partner) with respect to a Guest or its property; and (iv) all claims against MobileRVing.com in relation to or as a result of the failure of the Partner to (a) properly register with relevant tax authorities, or (b) pay, collect, remit or withhold any applicable Taxes, fees and (sur)charges levied or based on the services or other charges hereunder in the relevant jurisdiction. 6.3 Except as otherwise provided for in this Agreement, the maximum liability of one Party to any other party in aggregate for all claims made against such party under or in connection with this Agreement in a year shall not exceed the amount of 25,000 USD unless in the event of tort, fraud, willful misconduct, gross negligence, deliberate non-disclosure or deliberate deception on the part of the liable Party (i.e. the Indemnifying Party), in which event the limitation of liability is not applicable for such liable party. Parties agree and acknowledge that none of the limitations of liability set out in Clause 6 shall apply to any of the indemnifications with respect to third party claims (e.g. claims from Guests as described in 6.2) or third party liabilities. 6.4 In the event of a third party claim, Parties shall act in good faith and use their commercially reasonable efforts to consult, cooperate and assist each other in the defense and/or settlement of such claim, whereas the indemnifying Party shall be entitled to take over a claim and assume the defence (in consultation and agreement with the indemnified Party and with due observance of both Parties' interests), and neither Party shall make any admission, file any papers, consent to the entry of any judgment or enter into any compromise or settlement without the prior written consent of the other Party (which shall not unreasonably be withheld, delayed or conditioned). 6.5 In no event shall any Party be liable to any other Party for any indirect, special, punitive, incidental or consequential damages or losses, including loss of production, loss of profit, loss of revenue, loss of contract, loss of or damage to goodwill or reputation, loss of claim, whether such damages are (alleged as) a result of a breach of contract, tort or otherwise (even if advised of the possibility of such damages or losses). All such damages and losses are hereby expressly waived and disclaimed. 6.6 Each Party acknowledges that remedies at law may be inadequate to protect the other Party against any breach of this Agreement and without prejudice to any other rights and remedies otherwise available to the other Party, each Party will be entitled to injunctive relief and specific performance. 7. TERM, TERMINATION AND SUSPENSION 7.1 Unless agreed otherwise, this Agreement shall commence on the date hereof for indefinite period of time. Each Party may terminate this Agreement at any time and for any reason, by written notice to the other Party with due observance of a notice period of 14 days. 7.2 Each Party may terminate this Agreement (and close the Partner on the Platforms) or suspend (all or part of its obligations, covenants and undertakings under) this Agreement with respect to the other Party, with immediate effect and without a notice of default being required in case of: 7.2.1 a material breach by the other Party of any term of this Agreement (e.g. the provision of wrong information or receipt of a significant number of Guest complaints); or 7.3 Any notice or communication by MobileRVing.com of "closure" ("close", "closed") of the Partner on the webcontactus (or similar wording) shall mean termination of the Agreement. After termination, suspension or closure, the Partner shall honor outstanding reservations for Guests 7.4 The following events shall in any event be regarded as a material breach and entitle MobileRVing.com to immediately terminate (close) or suspend (all or part of its obligations, covenants and undertakings under) the Agreement (without a notice of default): (i) the Partner posts incorrect or misleading Partner Information on the Extranet; (ii) the Partner fails to maintain Information on the Extranet resulting in overbookings at the Partner; (iii) the Partner fails to accept a reservation at the price shown on a reservation; (iv) the Partner overcharges one or more guests; (v) MobileRVing.com receives one or more legitimate and serious complaint(s) from one or more guest(s) who made reservations with the Partner; (vi) misuse of the Guest review process by any behavior that results in a review appearing on the Platforms that is not an honest expression of a real stay by a real guest at the Partner; (vii) inappropriate, unlawful or unprofessional behavior toward guests or MobileRVing.com staff; or (viii) any (alleged) safety, privacy or health issues or problems with respect to the Partner or its facilities (the Partner shall at its own costs and upon first request from MobileRVing.com deliver the relevant permits, licenses, certificates or such statements issued by an independent expert evidencing and supporting its compliance with applicable (privacy, safety and health) laws and legislation). 7.5 Upon termination and save as set out otherwise, this Agreement shall absolutely and entirely be terminated with respect to the terminating Party and cease to have effect without prejudice to the other Party’s rights and remedies with respect to indemnification or a breach by the other (terminating) Party of this Agreement. Clause 2.4, 6, 8, 9 and 10 (and such other clauses that by nature survive termination) shall all survive termination. 7.6 In the event of a "change of ownership" with respect to the ownership or operation of the property (including any assignment, transfer, novation of this Agreement), the Partner agrees and acknowledges that the new owner/operator shall be entitled to use the Partner Information as made available by the Partner prior to the change of ownership (including the guest reviews) and have access to the relevant (financial and operational) performance, management and (customer) data and the Partner shall in any event be and remain responsible and liable for all obligations, claims and liabilities related to the period, or accrued prior to the change of ownership. 7.7 MobileRVing.com shall be entitled to terminate this Agreement with immediate effect in the event of (termination due to) a breach of contract of (including act or event of default or failure to perform any obligation under) any other agreement between MobileRVing.com on the one hand and the Partner (or any Party that (directly/indirectly) owns or controls, is controlled by or under the common control with the Partner) on the other hand. 8. BOOKS AND RECORDS 8.1 The systems, books and records of MobileRVing.com (including Extranet, the Online Reservation Statement, faxes and/or emails) shall be considered conclusive evidence of the existence and receipt by the Partner of the reservations made by the Guest. 8.2 The Partner shall upon first request from MobileRVing.com fully cooperate and assist MobileRVing.com with (and disclose all reasonably requested information with respect to) the identification of the (ultimate) owner, manager and/or controller of the Partner. 9. CONFIDENTIALITY 9.1 Parties understand and agree that in the performance of this Agreement, each Party may have access to or may be exposed to, directly or indirectly, confidential information from the other party (the "Confidential Information"). Confidential Information includes Customer Data, transaction volume, marketing and business plans, business, financial, technical, operational and other such non-public information either that a disclosing party designates as being private or confidential or which a receiving party should reasonably know should be treated as private and confidential. 9.2 Each Party agrees that: (a) all Confidential Information shall remain the exclusive property of the disclosing party and receiving party shall not use any Confidential Information for any purpose except in furtherance of this Agreement; (b) it shall maintain, and shall use prudent methods to cause its employees, officers, representatives, contracting parties and agents (the "Permitted Persons") to maintain, the confidentiality and secrecy of the Confidential Information; (c) it shall disclose Confidential Information only to those Permitted Persons who need to know such information in furtherance of this Agreement; (d) it shall not, and shall use prudent methods to ensure that the Permitted Persons do not, copy, publish, disclose to others or use (other than pursuant to the terms hereof) the Confidential Information; and (e) it shall return or destroy all ((hard and soft) copies of) Confidential Information upon written request from the other Party. 9.3 Notwithstanding the foregoing, (a) Confidential Information shall not include any information to the extent it (i) is or becomes part of the public domain through no act or omission on the part of the receiving party, (ii) was possessed by the receiving party prior to the date of this Agreement, (iii) is disclosed to the receiving party by a third party having no obligation of confidentiality with respect thereto, or (iv) is required to be disclosed pursuant to law, court order, subpoena or governmental authority, and (b) nothing in this Agreement shall prevent, limit or restrict a Party from disclosing this Agreement (including any technical, operational, performance and financial data (but excluding any Customer Data)) in confidence to an affiliated (group) company. 9.4 Parties shall use commercially reasonable efforts to safeguard the confidentiality and privacy of Customer Data and to protect it from unauthorized use or release. Each Party agrees to comply with all applicable (data and privacy) laws, rules and regulations of the jurisdiction where such Party is incorporated (including (if applicable) Directives 95/46/EC and 2002/58/EC (as amended) on the processing of personal data and the protection of privacy). Privacy What kind of personal information does MobileRVing.com use? When you make a reservation, you'll be asked for your name, address, telephone number, email address, rig size, pets and your preferences for your stay. To make it easier to manage your reservations, you can open a RV user account. This allows you to save your personal settings, review previous bookings and manage future reservations. When you visit our website, even if you don't make a reservation, we may collect certain information, like your IP address, which browser you’re using, and information about your computer’s operating system, application version, language settings and pages that have been shown to you. If you're using a mobile device, we might also collect data that identifies your mobile device, device-specific settings and characteristics, and latitude/longitude details. When you make a reservation, our system registers through which means and from which websites you've made your reservation. We may also receive information about you when you use certain social media services. Why does MobileRVing.com collect, use and share your personal data? Reservations: First and foremost, we use your personal data to complete and administer your online reservation and forward your reservation details to the accommodations you've booked. Customer Service: We provide customer service from our local offices. Sharing your details with our customer service staff allows us to respond when you need us – including helping you find appropriate accommodations and responding to any questions you might have about your reservation. Guest Reviews: We use your contact information to invite you by email to write a guest review after your stay. This can help other travelers choose the accommodations that suit them best. Account Administration: We offer a user account facility on our website. We use the information you give us to administer this, allowing you to manage your bookings, take advantage of special offers, make future reservations more easily and manage your personal settings. Managing personal settings allows you to keep and share lists, share photos, see accommodations you've searched for before, and see other information you've provided about accommodations and destinations. It also allows you to see any reviews you've submitted about places you've stayed in. If you want, you can share certain information in your user account by creating a public profile that’s associated with either your own first name or a screen name of your choice. The type of information you can share in this way includes your photo, the names of places you've stayed in, your lists, your plans for future trips, your reviews and other information about accommodations and destinations. Marketing Activities: We also use your information for marketing activities, as permitted by law. For example: When you make a reservation with us or set up a user account, we may use your contact information to send you news about similar travel-related products and services. With your consent—if consent is required under local law—we may also send you other regular newsletters by email. You can opt out, or unsubscribe, from marketing communications at any time using the "Unsubscribe" link in each newsletter. Based on the information you share with us, individualized offers may be shown to you on the MobileRVing.com website, in mobile apps or on third-party websites, including social media sites. These might be offers that you can book directly on the MobileRVing.com website, or third-party offers or products we think you might find interesting. If we believe that a particular offer may be of interest to you, we may decide to contact you by phone. Other Communications: There may be other times when we get in touch with you by email, traditional mail, phone or text message, depending on the contact information you share with us. There could be a number of reasons for this: We may need to respond to and handle requests you've made. If you haven't finalized a reservation online, we may email you a reminder to continue with your reservation. We believe that this additional service is useful to you because it allows you to carry on with a reservation without having to search for the accommodations again or fill in all the reservation details from scratch. When you use our services, we may send you a questionnaire or invite you to provide a review about your experience with MobileRVing.com. We may also send you other material related to your reservations, such as how to contact MobileRVing.com if you need assistance while you're away, and information that we feel might be useful to you in planning your trip or getting the best out of your stay. We may also send you material related to upcoming reservations or a summary of previous reservations you made through MobileRVing.com. Market Research: We sometimes ask our customers to take part in market research. Any additional personal details that you give us as part of the market research will only be used with your consent. Fraud Detection and Prevention: We may use personal data for the detection and prevention of fraud and other illegal or unwanted activities. Improving Our Services: Finally, we use personal data for analytical purposes, to improve our services, to enhance the user experience, and to improve the functionality and quality of our online travel services. How does MobileRVing.com use social media? We use social media to promote our accommodation partners’ properties and to promote, improve and facilitate our own services. For example, we integrated social media plugins into the MobileRVing.com website. So when you click on one of the buttons and register with your social media account, information is shared with your social media provider, and possibly presented on your social media profile to be shared with others in your network. In addition to implementing these buttons, MobileRVing.com uses social media by maintaining accounts and offering apps on several social media sites. These social media services may allow you to share information with MobileRVing.com. When you register with a social media app, you'll be told which information will be shared with MobileRVing.com. The information you choose to share with us may include the basic information that’s available in your social media profile, email address, status updates and your list of friends. This information is necessary to create a unique user experience either in the app itself or on our websites. It facilitates things like personalizing our website to suit your needs, connecting you with your friends on travel destinations, and analyzing and enhancing our travel-related services. We may also enable you to sign in to MobileRVing.com services with your social media accounts. Your social media provider will be able to tell you more about how they use and process your data in such cases. How does MobileRVing.com share your data with third parties? In certain circumstances, we may share your personal data with third parties. The Accommodations You Booked: In order to complete your reservation, we need to transfer relevant reservation details to the accommodations you've booked. This may include information such as your name, your contact details, RV size, pets traveling with you and any preferences you specified when making a booking. This information may also be used by MobileRVing.com or the accommodation providers to give you personalized offers related to the reservation. If you have a question about your reservation, we may contact the accommodation provider and ask them to handle your request. Third-party Service Providers: We may use service providers (such as "data processors") to process your personal data strictly on our behalf. This processing would be for purposes such as facilitating reservations, sending out marketing material or for analytical support services. These processors are bound by confidentiality clauses and are not allowed to use your personal data for their own purposes or any other purpose. Competent Authorities: We disclose personal data to law enforcement and other governmental authorities insofar as it is required by law or is strictly necessary for the prevention, detection or prosecution of criminal acts and fraud. Business Partners: We work with business partners around the world to distribute or advertise accommodations and to help our business partners distribute and advertise their travel-related services. This may mean that their services are integrated into our website or they have been enabled to show a customized advertisement on our website – or we are advertising on theirs. When you make a reservation on one of our business partners’ websites, certain personal data that you give them will be forwarded to us. Certain business partners may receive your personal data from us if requested by you. When you make a reservation on a business partners’ website, please read the privacy policies on these business partners’ websites for more information. How does MobileRVing.com use mobile devices? We have free apps for a variety of mobile devices and use versions of our regular website that have been optimized for mobile. These apps and mobile websites process the personal details you give us in much the same way as our website does – and they also allow you to use location services to find accommodations nearby. With your consent, we may send you push notifications with information about your reservation. How does MobileRVing.com use guest reviews and other destination-related information you share with us? After your stay at any accommodations booked through us, you'll be invited to submit a guest review. This invite may ask for information about the accommodations, the surrounding areas, and the destination. If you don’t want to use your name with the review, you can use a screen name (which you can choose in your user account), or the review can be displayed on the website anonymously. By completing a guest review, you're agreeing that it can be displayed (as described in detail in our Terms and Conditions) on, for example, the relevant accommodation information page on our websites, in our mobile apps, in our social media accounts and in social apps, or on the website of the relevant accommodations or our business partner’s website, to inform other travelers about the quality and services at the accommodations you stayed in. If you indicate that a guest review was helpful—or not helpful—we'll aggregate this with feedback from other customers in order to sort and prioritize guest reviews. We may use the information in your lists or in other destination-related information you share with us in anonymous form—unless you've included this information in your public profile—to help other travelers find the right destination. Cookies What is a cookie? A cookie is a small amount of data that is placed in the browser of your computer or on your mobile device. This Privacy and Cookies Policy applies to cookies and similar technologies (hereafter together referred to as “cookies”). Why are cookies used? Web pages have no memory. If you're surfing from page to page within a website, you won't be recognized as the same user across pages. Cookies allow you to be recognized as the same user across the pages of a website. Cookies also allow your choices to be remembered – choices such as the language you prefer, the currency you use and your search criteria. They will also make sure you're recognized when you return to a website. Do all cookies do the same thing? No, there are different types of cookies and different ways of using them. Cookies can be categorized according to their function, their lifespan, and according to who places them on a website. How are cookies used? Our website uses the following types of cookies: Technical Cookies: We try to provide our visitors with an advanced and user-friendly website that adapts automatically to their needs and wishes. To achieve this, we use technical cookies to show you our website, to make it function correctly, to create your user account, to sign you in and to manage your bookings. These technical cookies are absolutely necessary for our website to function properly. Functional Cookies: We also use functional cookies to remember your preferences and help you use our website efficiently and effectively, for example, by remembering your preferred properties and language, your searches and the accommodations you viewed earlier. These functional cookies are not strictly necessary for the functioning of our website, but they add functionality for you and enhance your experience. Analytics Cookies: We use these cookies to gain insight into how our visitors use the website, to find out what works and what doesn't, to optimize and improve our website and to ensure we continue to be interesting and relevant. The data we gather includes which web pages you've viewed, which referring/exit pages you've entered and left from, which platform type you've used, date and time stamp information, and details such as the number of clicks you make on a given page, your mouse movements and scrolling activity, the search words you use and the text you type while using our website. We also use analytics cookies as part of our online advertising campaigns to learn how users interact with our website after they've been shown an online advertisement – which may include advertisements on third-party websites. However, we will not know who you are, and will only obtain anonymous data. Our business partners may also use analytical cookies to learn if their customers use accommodation offers integrated into their websites. Commercial Cookies: We use third-party cookies as well as our own to display personalized advertisements on our websites and on other websites. This is called “retargeting,” and it's based on browsing activities, such as the destinations you've been searching for, the accommodations you've viewed and the prices you've been shown. Commercial cookies may also be used by select third parties to display their products and services through our website. How long do MobileRVing.com cookies stay active? The cookies we use have varying lifespans. The maximum lifespan we set on some is five years from your last visit to our website. You can erase all cookies from your browser any time you want. To remove MobileRVing.com cookies from your browser, go to your browser options, which vary based on the browser utilized, and delete cookies. How can you recognize MobileRVing.com cookies? You can find our cookies in your browser settings. Does MobileRVing.com use third-party marketing and analytics cookies? Yes, MobileRVing.com uses the services of trusted and recognized online advertising and marketing companies. MobileRVing.com may also use third-party providers for analytical purposes. To enable their services, these companies need to place cookies. The providers we use are committed to building consumer awareness and establishing responsible business and data management practices and standards. When it comes to online advertising and marketing companies, we strive to only work with companies that are members of the Network Advertising Initiative (NAI) and/or the Interactive Advertising Bureau (IAB). Members of NAI and IAB adhere to industry standards and codes of conduct. NAI and IAB members allow you to opt out of the behavioral advertising. Visit www.networkadvertising.org and www.youronlinechoices.com to identify the NAI members that may have placed an advertising cookie file on your computer. To opt out of an NAI or IAB member's behavioral advertising program, just check the box that corresponds to the company from which you wish to opt out. In order to control the collection of data for analytical purposes by Google Analytics, you may want to visit the following link: Google Analytics Opt-out Browser Add-on. Who has access to MobileRVing.com cookie data? Only MobileRVing.com has access to MobileRVing.com cookies. Cookies placed by third parties can be accessed by these third parties. How can you manage your cookie preferences? Using your browser settings in, for example, Internet Explorer, Safari, Firefox or Chrome, you can set which cookies to accept and which to reject. Where you find these settings depends on which browser you use. Use the "Help" function in your browser to locate the settings you need. If you choose not to accept certain cookies, you may not be able to use some functions on our website. However, we do not otherwise support “Do Not Track” browser settings. Opting out of an online advertising network does not mean that you will no longer receive or be subject to online advertising or marketing analysis. It means that the network from which you opted out will no longer deliver ads customized to your web preferences and browsing patterns. Does MobileRVing.com use web beacons? In addition to using cookies, MobileRVing.com sometimes uses web beacons. A web beacon is a tiny graphic image of just one pixel that’s delivered to your computer either as part of a web page request or in an HTML email message. Either directly or through service providers, we use these pixels as part of our online advertisements either on our website or on third-party websites to learn whether a user who's being shown an online advertisement also makes a reservation, to track conversion with partner websites and to analyze a user's traffic patterns in order to optimize the travel-related services we bring to you. Security What security procedures does MobileRVing.com put in place to safeguard your personal data? We use appropriate business systems and procedures to protect and safeguard the personal data you give us. We also use security procedures and technical and physical restrictions for accessing and using the personal data on our servers. Only authorized personnel are permitted to access personal data in the course of their work. Children The services offered by MobileRVing.com are not directed at children under 18 years old. The use of any of our services is only allowed with the valid consent of a parent or a guardian. If we receive information from a child under 18 years old, we reserve the right to delete it. Direct communication: In cases of reservation-related disputes, we may provide the accommodation provider, upon request, information about the reservation process (for example, a copy of your reservation confirmation as proof that a reservation was made). How does MobileRVing.com process direct communication between you and the property you booked? MobileRVing.com offers you and accommodation providers different ways to communicate about existing reservations. You can either contact MobileRVing.com for questions about your reservation, or communicate directly with an accommodation provider through dedicated messaging fields or by making use of alias emails. For security purposes, MobileRVing.com has an automated system that screens all communications for malicious content. That includes spam and the limitation of certain file types, such as .zip, .rar and .exe files. In the event communications with malicious content are detected, the communication may be blocked and/or forwarded to the MobileRVing.com Fraud Team for further investigations. Note that all communications sent and received using MobileRVing.com communication tools will be stored by MobileRVing.com. To the extent permitted by law, MobileRVing.com will only access communication between you and accommodation providers upon your or the provider's request, when required by law, when strictly necessary for security or law enforcement purposes, or when MobileRVing.com otherwise has a legitimate interest, such as detecting and preventing fraud and misuse. MobileRVing.com may analyze the anonymized content of communications to improve its services. These Terms and Conditions, as may be amended from time to time, apply to all our services directly or indirectly (through RV Resort, Campground, State Park, RV Park and other Outdoor Hospitality partners) made available online, through any mobile device, by email or by telephone. By accessing, browsing and using our (mobile) webPartner or any of our applications through whatever platform (hereafter collectively referred to as the "webPartner") and/or by completing a reservation, you acknowledge and agree to have read, understood and agreed to the Terms and Conditions set out below (including the privacy statement). These pages, the content and infrastructure of these pages, and the online reservation service provided on these pages and through the webPartner are owned, operated and provided by MobileRVing.com and are provided for your personal, non-commercial use only, subject to the Terms and Conditions set out below. 0. Definitions "MobileRVing.com," "us," "we" or "our" means MobileRVing.com, a Corporation that has been incorporated under the laws of the State of Florida, and having its registered address at 7676-B Peters Road, Plantation FL 33324. "Platform" means the (mobile) webPartner and app on which the Service is made available owned, controlled, managed, maintained and/or hosted by MobileRVing.com. "Service" means the online reservation service (does not include the facilitation of payments) of any products and services as this is handled upon check-in. "Partner" means the provider of accommodation (e.g. any privately or publicly owned, campground, RV park and/or RV resort), Marina, and any other travel or related product or service as from time to time available for reservation on the Platform. 1. Scope of Our Service Through the Platform, we (MobileRVing.com and its affiliate (distribution partners) provide an online platform through which Partners can advertise their products and service for reservation, and through which visitors to the Platform can make such reservations. By making a reservation through MobileRVing.com, you enter into a direct (legally binding) contractual relationship with the Partner with which you make a reservation or purchase a product or service (as applicable). From the point at which you make your reservation, we act solely as an intermediary between you and the Partner, transmitting the details of your reservation to the relevant Partner(s) and sending you a confirmation email for and on behalf of the Partner. When rendering our services, the information that we disclose is based on the information provided to us by Partners. As such, the Partners are given access to an Extranet through which they are fully responsible for updating all rates, availability and other information which is displayed on our Platform. Although we will use reasonable skill and care in performing our services we will not verify if, and cannot guarantee that, all information is accurate, complete or correct, nor can we be held responsible for any errors (including manifest and typographical errors), any interruptions (whether due to any (temporary and/or partial) breakdown, repair, upgrade or maintenance of our Platform or otherwise), inaccurate, misleading or untrue information or non-delivery of information. Each Partner remains responsible at all times for the accuracy, completeness and correctness of the (descriptive) information (including the rates and availability) displayed on our Platform. Our Platform does not constitute and should not be regarded as a recommendation or endorsement of the quality, service level, qualification or (star) rating of any Partner (or its facilities, venue, products or services) made available. Our Service is made available for personal and non-commercial use only. Therefore, you are not allowed to resell, deep-link, use, copy, monitor (e.g. spider, scrape), display, download or reproduce any content or information, software, reservations, tickets, products or services available on our Platform for any commercial or competitive activity or purpose. 2. Prices, Crossed-Out Rates and Best Price Guarantee The prices on our Platform are highly competitive. All site prices are per site for your entire stay and all prices are displayed including VAT/sales tax and all other taxes (subject to change of such taxes), unless stated differently on our Platform or the confirmation email. Applicable fees and taxes (including tourist/city tax) may be charged by the Partner in the event of a no-show or cancellation fee. Sometimes cheaper rates are available on our Platform for a specific stay, product or service, however, these rates made available by Partners may carry special restrictions and conditions, for example non-cancelable and non-refundable. Please check the relevant product, service and reservation conditions and details thoroughly for any such conditions prior to making your reservation. Obvious errors and mistakes (including misprints) are not binding. All special offers and promotions are marked as such. 3. Privacy and Cookies MobileRVing.com respects your privacy. Please take a look at our Privacy and Cookies Policy for further information. 4. Free of Charge Our Service is free of charge because, unlike many other parties, we will not charge you for our Service or add any additional (reservation) fees to the rate. Advertisers within the website pay fees (being a small pay per click rate) to MobileRVing.com to be displayed within the program. 6. Prepayment, Cancellation, No-shows and The Fine Print By making a reservation with a Partner, you accept and agree to the relevant cancellation and no-show policy of that Partner, and to any additional (delivery) terms and conditions of the Partner that may apply to your visit or stay (including The Fine Print of the Partner made available on their respective website), including for services rendered and/or products offered by the accommodation provider (the delivery terms and conditions of an accommodation provider can be obtained with the relevant accommodation provider). The general cancellation and no-show policy of each Partner is made available on their website which can be found on the Partner information pages located within their profile on MobileRVing.com. Please note that certain rates or special offers are not eligible for cancellation or change. Applicable city/tourist tax may still be charged by the Partner in the event of a no-show or charged cancellation. Please check the (reservation) details of your product or service of choice thoroughly for any such conditions prior to making your reservation. Cancellation and prepayment policies may vary according to site type. Please carefully read The Fine Print (within the partner websites) and Important Information in your reservation confirmation for additional policies as may be applied by the Partner (e.g. with respect to age requirement, security deposit, non-cancellation/additional supplements for group bookings, extra sites/no free firewood, pets/cards accepted). If you wish to review, adjust or cancel your reservation, please call the campground listed on your reservation confirmation email. Please note that you may be charged for your cancellation in accordance with the accommodation provider's cancellation, (pre)payment and no-show policy or not be entitled to any repayment of any (pre)paid amount. We recommend that you read the cancellation, (pre)payment and no-show policy of the accommodation provider carefully prior to making your reservation and remember to make further payments on time as may be required for the relevant reservation. If you have a late or delayed arrival on the check-in date or only arrive the next day, make sure to (timely/promptly) communicate this with the Partner so they know when to expect you to avoid cancellation of your reservation or site or charge of the no-show fee. Our Customer Service department can help you if needed with informing the Partner. MobileRVing.com does not accept any liability or responsibility for the consequences of your delayed arrival or any cancellation or charged no-show fee by the Partner. 7. (Further) Correspondence and Communication By completing a booking, you agree to receive (i) an email which we may send you shortly prior to your arrival date, giving you information on your destination and providing you with certain information and offers (including third party offers to the extent that you have actively opted in for this information) relevant to your reservation and destination, and (ii) an email which we may send to you promptly after your stay inviting you to complete our guest review form. Please see our Privacy and Cookies Policy for more information about how we may contact you. MobileRVing.com disclaims any liability or responsibility for any communication with the Partner on or through its platform. You cannot derive any rights from any request to, or communication with the Partner or (any form of) acknowledgement of receipt of any communication or request. MobileRVing.com cannot guarantee that any request or communication will be (duly and timely) received/read by, complied with, executed or accepted by the Partner. In order to duly complete and secure your reservation, you need to use your correct email address. We are not responsible or liable for (and have no obligation to verify) any wrong or misspelled email address or inaccurate or wrong (mobile) phone number or credit card number. Any claim or complaint against MobileRVing.com or in respect of the Service must be promptly submitted, but in any event within 30 days after the scheduled day of consummation of the product or service (e.g. check out date). Any claim or complaint that is submitted after the 30 days period, may be rejected and the claimant shall forfeit its right to any (damage or cost) compensation. Due to the continuous update and adjustments of rates and availability, we strongly suggest to make screenshots when making a reservation to support your position (if needed). 8. Ranking, Preferred Program, Stars and Guest Reviews The default setting of the ranking of Partners on our Platform is "Recommended" (or any similar wording) (the "Default Ranking"). For your convenience, we also offer other ways to rank the Partner. Please note that the Default Ranking is created through a fully automated ranking system (algorithm) and is based on multiple criteria. In certain cities and regions, MobileRVing.com operates a preferred partnership program, allowing certain Partners that meet and maintain the preferred program terms to be listed ahead of the rest of the Partners in the default “Recommended” ranking for the relevant city/region. 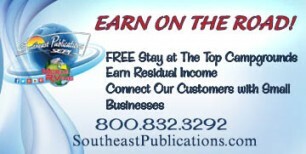 The preferred Partners are marked with a “Preferred Property” symbol and in return for this high ranking, the preferred Partner enables Southeast Publications access to their local advertising market. Only Partners that meet and maintain certain qualification criteria can be listed as preferred. The stars used for non-camping accommodations (e.g. marina) do not correspond to the star ranking system as may be applicable to camping accommodations. The completed guest review may be (a) uploaded onto the relevant Partner's information page on our Platform for the sole purpose of informing (future) customers of your opinion of the service (level) and quality of the Partner, and (b) (wholly or partly) used and placed by MobileRVing.com at its sole discretion (e.g. for marketing, promotion or improvement of our service) on our Platform or such social media platforms, newsletters, special promotions, apps or other channels owned, hosted, used or controlled by MobileRVing.com. We reserve the right to adjust, refuse or remove reviews at our sole discretion. The guest review form should be regarded as a survey and does not include any (further commercial) offers, invitations or incentives whatsoever. 9. Disclaimer Subject to the limitations set out in these terms and conditions and to the extent permitted by law, we shall only be liable for direct damages actually suffered, paid or incurred by you due to an attributable shortcoming of our obligations in respect to our services, up to an aggregate amount of the aggregate cost of your reservation as set out in the confirmation email (whether for one event or series of connected events). However and to the extent permitted by law, neither we nor any of our officers, directors, employees, representatives, subsidiaries, affiliated companies, distributors, affiliate (distribution) partners, licensees, agents or others involved in creating, sponsoring, promoting, or otherwise making available the Partner and its contents shall be liable for (i) any punitive, special, indirect or consequential loss or damages, any loss of production, loss of profit, loss of revenue, loss of contract, loss of or damage to goodwill or reputation, loss of claim, (ii) any inaccuracy relating to the (descriptive) information (including rates, availability and ratings) of the Partner as made available on our Platform, (iii) the services rendered or the products offered by the Partner or other business partners, (iv) any (direct, indirect, consequential or punitive) damages, losses or costs suffered, incurred or paid by you, pursuant to, arising out of or in connection with the use, inability to use or delay of our Platform, or (v) any (personal) injury, death, property damage, or other (direct, indirect, special, consequential or punitive) damages, losses or costs suffered, incurred or paid by you, whether due to (legal) acts, errors, breaches, (gross) negligence, willful misconduct, omissions, non-performance, misrepresentations, tort or strict liability by or (wholly or partly) attributable to the Partner or any of our other business partners (including any of their employees, directors, officers, agents, representatives or affiliated companies) whose products or service are (directly or indirectly) made available, offered or promoted on or through the Platform, including any (partial) cancellation, overbooking, strike, force majeure or any other event beyond our control. Whether or not the Partner has charged you for your site, product or service, you agree and acknowledge that the Partner is at all times responsible for the collection, withholding, remittance and payment of the applicable taxes due on the total amount of the (site/reservation) price to the relevant tax authorities. MobileRVing.com is not liable or responsible for the remittance, collection, withholding or payment of the relevant taxes due on the (site/reservation) price to the relevant tax authorities. MobileRVing.com does not act as the merchant of record for any product or service made available on the Platform. By uploading photos/images onto our system (for instance on MRV Connect, MRV The Buzz or MobileRVing.com) you certify, warrant and agree that you own the copyright to the photos/images and that you agree that MobileRVing.com may use the uploaded photos/images on its (mobile) webPartner and app, and in (online/offline) promotional materials and publications and as MobileRVing.com at its discretion sees fit. You are granting MobileRVing.com a non-exclusive, worldwide, irrevocable, unconditional, perpetual right and license to use, reproduce, display, have reproduced, distribute, sublicense, communicate and make available the photos/images as MobileRVing.com at its discretion sees fit. By uploading these photos/images the person uploading the picture(s) accepts full legal and moral responsibility of any and all legal claims that are made by any third parties (including, but not limited to, property owners) due to MobileRVing.com publishing and using these photos/images. MobileRVing.com does not own or endorse the photos/images that are uploaded. The truthfulness, validity and right to use of all photos/images is assumed by the person who uploaded the photo, and is not the responsibility of MobileRVing.com. MobileRVing.com disclaims all responsibility and liability for the pictures posted. The person who uploaded the photo warrants that the photos/images shall not contain any viruses, Trojan horses or infected files and shall not contain any pornographic, illegal, obscene, insulting, objectionable or inappropriate material and does not infringe any third party (intellectual property right, copyright or privacy) rights. Any photo/image that does not meet the aforesaid criteria will not be posted and/or can be removed/deleted by MobileRVing.com at any time and without prior notice. 10. Intellectual Property Rights Unless stated otherwise, the software required for our services or available on or used by our Platform and the intellectual property rights (including the copyrights) of the contents and information of and material on our Platform are owned by MobileRVing.com, its Partners or providers. MobileRVing.com exclusively retains ownership of all rights, title and interest in and to (all intellectual property rights of) (the look and feel (including infrastructure) of) the Platform on which the service is made available (including the guest reviews and translated content) and you are not entitled to copy, scrape, (hyper-/deep)link to, publish, promote, market, integrate, utilize, combine or otherwise use the content (including any translations thereof and the guest reviews) or our brand without our express written permission. To the extent that you would (wholly or partly) use or combine our (translated) content (including guest reviews) or would otherwise own any intellectual property rights in the Platform or any (translated) content or guest reviews, you hereby assign, transfer and set over all such intellectual property rights to MobileRVing.com. Any unlawful use or any of the aforementioned actions or behaviour will constitute a material infringement of our intellectual property rights (including copyright and database right). 11. Miscellaneous If any provision of these terms and conditions is or becomes invalid, unenforceable or non-binding, you shall remain bound by all other provisions hereof. In such event, such invalid provision shall nonetheless be enforced to the fullest extent permitted by applicable law, and you will at least agree to accept a similar effect as the invalid, unenforceable or non-binding provision, given the contents and purpose of these terms and conditions. 12. About MobileRVing.com and the support companies The online reservation service is rendered by MobileRVing.com, which is a private Corporation, incorporated under the laws of the Florida and having its offices at 7676-B Peters Road, Plantation, FL. MobileRVing.com has its headquarters in Plantation, Florida and is supported by various affiliated group companies (the "support companies") throughout the world. The support companies only provide an internal supporting role to and for the benefit of MobileRVing.com. Certain designated support companies render limited customer care support services (only by telephone). The support companies do not have any Platform (and do not in any way control, manage, maintain or host the Platform). The support companies do not have any power or authority to render the service, to represent MobileRVing.com or to enter into any contract in the name of, for or on behalf of MobileRVing.com. You do not have a (legal or contractual) relationship with the support companies. The support companies do not operate and are not authorized to act as any form of process or service agent of MobileRVing.com. MobileRVing.com does not accept nor assume any domicile at any place, location or office in the world (also not at the office of its support companies), other than its registered office in Florida.